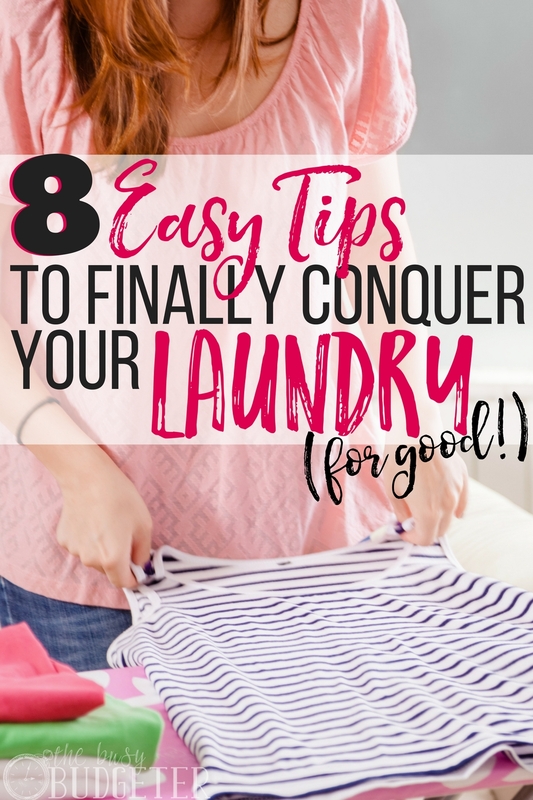 Laundry Basics: 8 Laundry Tips To Conquer Your Laundry for Good! Laundry. It’s one of the toughest jobs around the house. It’s a job you put off, hoping it will go away (but it never does and somehow dirty clothes only seem to multiply). After a week or two of ignoring the laundry, you have no clean clothes and a smelly pile of dirty stuff you don’t want to deal with. Your only option is to bravely scale Mount St. Laundry. Well, no more! I’m going to help you conquer the laundry mountain for good! It’s time to put on your (clean) big girl pants and deal with this mess! I want you to right now, today, commit to NEVER GETTING BEHIND ON LAUNDRY AGAIN. And hey, you can do this. 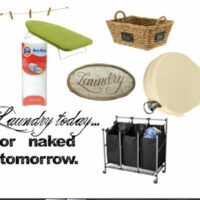 I’ll tell you how with these easy laundry basics! I’ve found staying up on just TWO household tasks makes ALL the difference when keeping your house clean. Those two jobs? Laundry and dishes. Today we’re going to focus on the laundry basics. Nothing will make your life feel like a disaster zone faster than facing a big pile of dirty laundry, dealing with nothing to wear and having to turn socks (or other items…ahem) inside out, because they’re in-between washing. Unfortunately, this life skill isn’t something we’re born with. Doing laundry is a skill we learn how to do when we get older. Many of us don’t learn this skill until we’re living on our own and wondering why our laundry doesn’t magically appear clean and folded in our drawers. Here’s the deal—laundry is part of being a grownup. It’s a job we all must do. If you’ve got a washer, I want you to tackle laundry every single day. I want you to make laundry part of your regular routine. Trust me, you can make this happen. If you’re living in an apartment, doing laundry becomes even MORE of a challenge because you can’t do laundry daily. I know it’s not reasonable to expect someone to go to the laundromat every single day, but washing clothes is a weekly job at minimum. Particularly because nothing will make small space living feel claustrophobic faster than a mountain of laundry in your closet or on the floor. It’s time to conquer the laundry mountain once and for all. 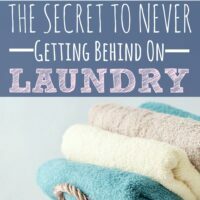 I’m going to walk you through these great laundry basics tips to keep you motivated and ready to knock out your laundry! If you’ve got a washer and dryer in your house, there’s no excuse to ever fall behind on the laundry. I know, you’re thinking you don’t have time and laundry seems like SUCH a process. I literally timed myself doing a load of laundry and I can tell you, it takes less than TWO minutes of work to put laundry in the washer, start the machine and go on with my day (and switch the clothes to the dryer in between). Putting the laundry away takes roughly five minutes for a small load. That’s seven minutes of laundry per day. Look, I know you're busy…but I also know you have seven minutes in your day. 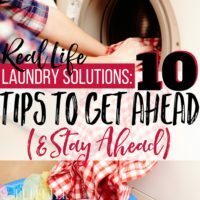 Here’s the deal: if you’re struggling to stay up on housework, feel like your home is a hot mess, and don’t know how to do it all, I want you to start with staying on top of your laundry. Doing one load of laundry per day will be a game-changer for you. Staying on top of laundry will keep you motivated and help you avoid having to deal with piles of dirty clothes everywhere. Start a routine. Do your load of laundry every day at the same time. Establish laundry as a daily habit like brushing your teeth or washing your face. Do laundry in the morning if you find time, but I find evenings are a little less hectic. When you start dinner at night, put in a load of laundry. Cook dinner, eat, and when you clean up, switch the load to the dryer. When it’s time to go to bed, quickly put the clothes away. I know it will seem silly to do a tiny load of laundry each day and it might even seem like a waste. It’s not about having every item in your house clean. It’s about establishing a regular routine of doing laundry. Even if the loads are small, it’s worth it to never deal with a dirty, messy pile of laundry again! If you’re starting out, chances are you’re facing a BIG pile of laundry. Each day you’re going to do a load until you’re caught up. Then you’re never going to get behind again. Since there’s a lot of laundry sort it—darks, lights, towels. Going forward, especially if you’re doing small loads, simply wash every load on warm or cool. Little loads of laundry will get clean and most detergent prevents bleeding and fading. You can invest in a mesh laundry bag to keep by the washing machine. If you’re worried about items that shouldn’t get tossed in the dryer, put them in the bag. 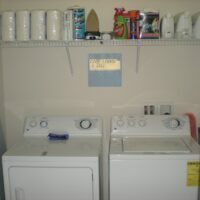 When the load is finished, simply take out the bag and hang up the items to dry before throwing the rest in the dryer. You might want to invest in a set of laundry sorting baskets (one for whites, one for colors) but I say hold off until you’re really in a routine of doing your laundry every day. Your clothes are much better off washed in small loads (as opposed to mildewing in a wrinkled dirty pile for weeks). Sorting the laundry encourages you to wait until you’ve collected enough “darks” or “lights” to do a load. Don’t wait. If you’re motivated by treats, give yourself laundry soap you’re excited about—a fun scent or interesting brand. You certainly can get your clothes as clean with the cheap bargain brand (which is what I recommend) but if you need a little incentive and “nice detergent” will do it? I say it’s worth the investment. Similarly, find a way to reward yourself if you get caught up on laundry and stay caught up. After a month of being freed from the laundry monster, go on a special date night, buy new hangers and clean out your closet or do another fun activity to keep you motivated. Keep your laundry area cleaned up and clutter-free. It’s more motivating to do laundry in a nice space (as opposed to a scary basement). If your laundry area is less-than optimal, do what you can to spruce up and brighten the space. The job will become a little more pleasant. If you must go to the laundromat to do laundry, set up a regular visit to the laundromat once a week. Pick a weeknight, for example, and set the evening as your “Laundry Night.” Weekends are more flexible, but keep in mind—the laundromat is busier on the weekends, so plan accordingly. Keep your laundry date by putting it on the calendar and refusing to let any other obligation “bump” it to another day, as though the time was for a class or a doctor appointment. If you adhere to your laundry schedule as an important commitment, you’ll stay up on it. Figure in enough time so you aren’t rushing in and out and can deal with any problems you run into. Usually an hour and a half to two hours is enough time, particularly if the facility offers access to multiple large washers and dryers. I want you to figure out what will REALLY motivate you to stick to your laundry appointment. Do you love a favorite drink at Starbucks? Do you stream a certain TV show, play a favorite videogame regularly, or listen to a podcast you really enjoy? I want you to make this your laundromat-only treat. Associating something really fun with your laundromat trip will make the job SO much better. A fun reward will keep you motivated to go and even—gasp!—possibly looking forward to your laundry day! Find a laundromat with WIFI or save up for your favorite magazine or book. Whatever your laundromat treat is, ONLY allow yourself to enjoy it during your weekly visit to do laundry. How many times have you avoided doing laundry because you couldn’t find enough quarters? Or because you didn’t own a bag big enough to haul your laundry there and back? Or maybe you didn’t want to deal with public transportation or didn’t have a ride. Whatever your excuses for putting off trips to the laundromat, I want you to figure them out and tackle them. Call a Lyft to get you to the laundromat and get your wash caught up. (Pricey I know, but this is just one time to get caught up.) Once you’re caught up, NEVER let your laundry amount exceed what fits in your bag, so it's easier to haul. Doing laundry once a week at minimum will help you avoid this excuse. Get quarters at the bank or credit union and start a quarter jar. Every time you get change at the store, get in the habit of asking for a dollar back in quarters and add the change to your jar. Keep a surplus of quarters on hand so you no longer lean on the “no quarters” excuse. Laundromat users know that the machines aren’t always top notch. Your clothes will get cleaner and turn out better if you are washing smaller loads (they will also dry much faster). It’s often hard to control the temperature, so plan accordingly by using liquid detergent. Powders might not dissolve and leave behind marks on your clothes. The last job you want to do is run a load twice when you’re at the laundromat. Look for liquid soap in small containers or pods, which are easier to transport to and from the laundromat. Bring along a few dryer sheets, as opposed to lugging a whole box with you on the trip. When you are caught up on your laundry, you’ll feel amazed at how FREEING and relaxing it is! Your whole house will feel cleaner. No longer will you like there’s a task “hanging over your head.” Stop making excuses and putting laundry off. With these laundry basics, you'll take your least-favorite household task from miserable to manageable. Set yourself up for success by creating incentives and making laundry a regular routine. Tackle laundry today with these laundry basics and it might change your whole outlook! So, what are your tips for staying caught up on laundry? How do you manage to keep yourself motivated to visit the laundromat regularly? Eliminating excuses is definitely a must. The longer you delay doing laundry, the larger that pile grows and it seems even more daunting. Schedule a time and get to it! That’s what I do and it really helps. If it’s on my calendar, I can’t say I’m too busy with other things. I couldn’t agree more. Keeping up with the laundry and dishes is the key to my sanity! I do (at least) one load of laundry per day. Once it’s dry, I dump it on my (or my son’s) bed, ensuring it will be folded before we go to sleep. I totally agree that the secret is doing it every day. If I just do one load a day during the week, then I don’t have so much to do on the weekend. I put it on at night and hang it / put in dryer in the morning. Then it gets put away after work. I totally agree. I feel that the one load a day rule is the only way to keep up, even though occasionally I do two in one day since I take Sunday off. I’ve been doing it for years now. I’m always reminded of why I do one load a day when we return from vacation. It often takes me 8 or more loads to catch back up! Superb article and the tips given by you are very good and i tried these tips many times its working Thanks ….